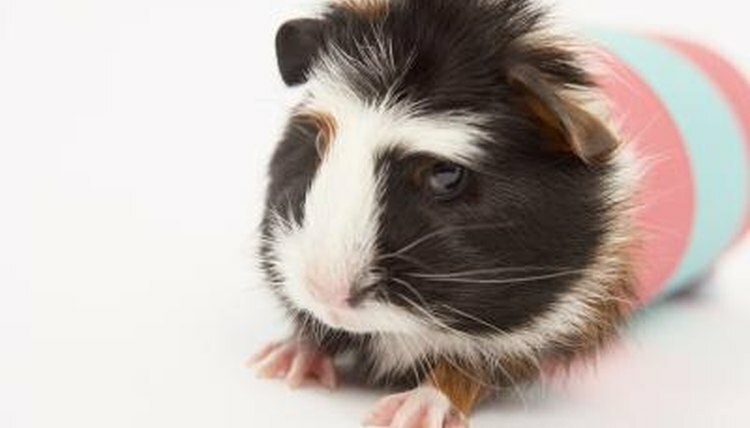 One mistake inexperienced guinea pig owners often make is keeping one cavy by himself instead of adopting a pair. Guinea pigs are naturally social creatures, and they require companionship to be happy and fulfilled. If a guinea pig remains alone for too long, it can have an effect on not only his psychological well-being, but his physical health as well. In the wild, guinea pigs congregate in large herds, constantly interacting with others of their kind. Domesticated guinea pigs rarely have access to that kind of a social structure, but in almost every case, a guinea pig will be happier and more fulfilled with other cavies to keep him company. A guinea pig left alone tends to be more fearful and skittish, and may be more prone to depression than one with a companion in the cage. A lonely guinea pig may cry out for attention or develop annoying habits like rattling water bottles or chewing on cage bars. A solitary guinea pig also misses some of the other benefits of companionship. When two guinea pigs form a close bond, they may begin to take care of each other. If one guinea pig begins to slow down due to arthritis or other ailments as he ages, a bonded companion might help him by dragging vegetables or pushing pellet bowls closer to his friend. If a guinea pig injures himself or becomes stuck in the cage bars or other furniture, his companion may wheek loudly to draw your attention. Not every pair of guinea pigs forms such a close bond, but a cavy living alone never has the chance. Paired guinea pigs will also help keep each other active. Guinea pigs enjoy playing, chasing each other and running laps around the cage. Sometimes even a contentious relationship can keep both animals active, as the more dominant cavy rousts his submissive partner from the best napping spots and steals the best food. A lonely guinea pig may become sedentary without a companion to keep him active, which can have a negative effect on his health. In some cases, a solitary guinea pig may bond with his human owner. While in rare cases this can be a suitable substitute for a guinea pig companion, it requires you to give your pet an enormous amount of attention to keep him happy and well-adjusted. Unless you can commit to spending a few hours each day interacting with your guinea pig, your best bet is to adopt him a friend. Can Lovebirds Be Kept Outside?